"A Christmas tree is annually prepared, by Her Majesty's command, for the Royal children. "The tree employed for this festive purpose is a young fir, about eight feet high, and has six tiers of branches. On each tier or branch are arranged a dozen wax tapers. Pendent from the branches are elegant trays, baskets, bonbonniers, and other receptacles for sweetmeats, of the most varied kind, and of all forms, colours, and degrees of beauty. Fancy cakes, gilt gingerbread, and eggs filled with sweetmeats are also suspended by variously coloured ribands from the branches. "The tree, which stands upon a table covered with white damask, is supported at the root by piles of sweets of a larger kind, and by toys and dolls of all descriptions, suited to the youthful fancy, and to the several ages, of the scions of Royalty for whose gratification they are displayed. "The name of each recipient is affixed to the doll, bonbon, or other present intended for it, so that no difference of opinion in the choice of dainties may arise to disturb the equanimity of the illustrious juveniles. "On the summit of the tree stands the small figure of an angel, with outstretched wings, holding in each hand a wreath. Similar trees are arranged in the various apartments of the Castle for the Duchess of Kent and the Royal household. "These trees are objects of much interest to all visitors at the Castle, from Christmas-Eve, when they are first set up, until Twelfth-night, when they are finally removed. They are not accessible to the curiosity of the public, but Her Majesty's visitors accompany the Queen from room to room to inspect them when they are illuminated. "Her Majesty's tree is furnished by his Royal Highness Prince Albert, whilst that of the Prince is furnished according to the taste of Her Majesty. The other trees are jointly provided by Her Majesty and the Prince, who plan and arrange the gifts of the table." 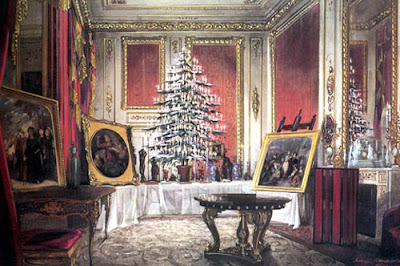 Shown at top: Queen Victoria's Christmas tree at Windsor in 1850 as painted by James Roberts (1824 - 1867). The presents around the tree are from Prince Albert. The Royal Collection © 2003, Her Majesty Queen Elizabeth II. This sight was great for my school project! The pictures are great, Thanks! This site was wonderful for my school project! The pictures were great too! Thanks! The picture of the Christmas tree with the family is from the American 1850 copy of the 1848 print of Victoria and Albert. Please note that the Americans took off Victoria's crown and removed Albert's mustash.